Designed for Restoration. Designed for You. - Next Gear Solutions, Inc. 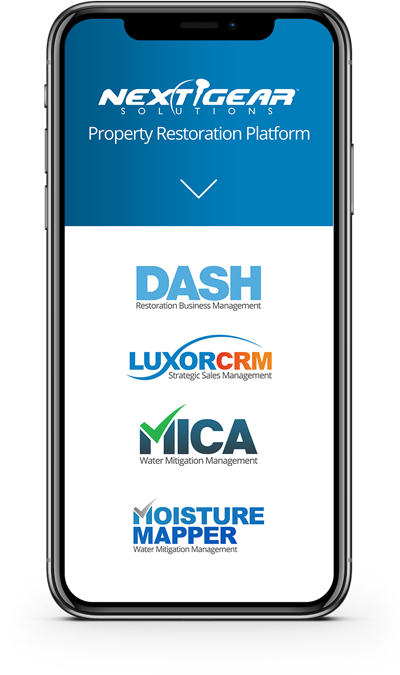 Serving the restoration workflow needs of service providers and carriers. Restoration jobs are aren't designed to be easy. Restoration contractors never expect any two jobs to be the same and they never are. Sometimes it's difficult to know exactly what needs to be done and when on a specific job type, on a job with a specific program, or on a job from a specific carrier. All of the task lists can become overwhelming when you have multiple jobs going on from multiple sources. At Next Gear, we pride ourselves on the solutions we've specifically designed for restoration contractors. We strive to make their jobs and lives easier while making them excel in their industry. Our restoration software solutions provide intuitive workflows for program work and compliance tasks by simply alerting the responsible party of exactly what they need to do, when they need to do it. These workflows are fully customizable and make use of mobile technology ensuring every item on a job task list gets completed on time and you get paid faster. Custom workflows are just one solution that designed for restoration. Schedule a consultation and let one of our experts explain everything we've designed for you.